An author friend has a new book out and it sounds fascinating. I’m also a big fan of his history blog. 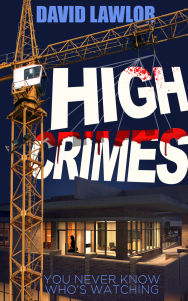 This is a big day for me – my new novel, High Crimes, is now available on Amazon. It is the first time I’ve stepped out of historical fiction and into the modern world. High Crimes is a tale of stalkers and abusers and how their victims finally decide to fight back. You can read the blurb below and the opening two chapters to give you a flavour of what lies ahead. Writing a novel is a solitary process, but one which is never really possible without proper feedback from readers. Prior to publishing High Crimes, I got that feedback from a group of talented and very supportive authors. My pleasure. I love crime stories.